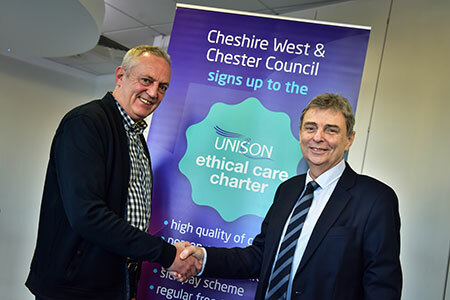 Cheshire West and Chester Council is pledging its support for UNISON's ethical care charter, which benefits care workers and the vulnerable people they look after. The core principles of the charter are now embedded into the Council’s care provider contracts for residential and nursing homes. The charter helps to ensure adequate staffing levels and sufficient time for workers to care for vulnerable people. Staff don't rush from one client to the next, they provide quality care for each individual. Staff are also paid for travel time and expenses and receive occupational sick pay. There are opportunities for staff to have frequent meetings to avoid isolation and staff receive free training on a regular basis to ensure they continue to update their skills and provide a good service. UNISON General Secretary, Dave Prentis said: “Making this commitment to decent employment conditions for care workers is vital for improving the quality of life for the people they look after. “UNISON’s ethical care charter is leading the way in highlighting the importance of care work and in fighting to win the pay and conditions they deserve. “The charter sets out minimum employment standards that will end the bad practices that we too-often see in social care. Care staff should not be having to dash around between service users without the time to care. They should not be on poverty pay or having to work when they are ill. They should not be isolated and they should not be afraid to raise concerns about services with their employer. For more information on the UNISON Ethical Care Charter at Cheshire West and Chester Council, please go to www.cheshirewestandchester.gov.uk.